Be on the lookout for a special Starbucks tumbler at your neighborhood store: You buy the tumbler and you can fill it with coffee – at no charge to you – during the month of January! This isn’t the first time that Starbucks has had such a promotion. 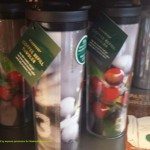 In December 2011, Starbucks first offered the “January Coffee Tumbler,” where you purchase the tumbler in November or December (usually these are available officially starting the day after Thanksgiving) and the following January your coffee is free, if you’re using your special tumbler. This year has the same promotion. 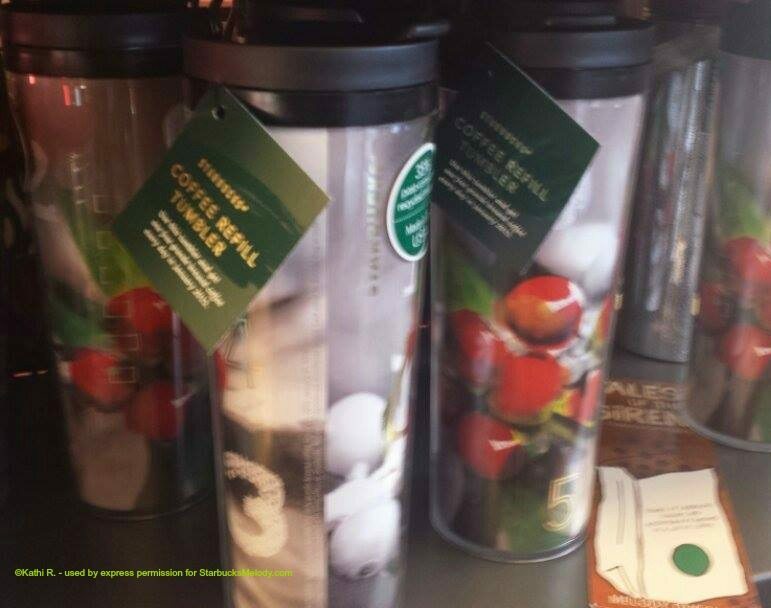 Buy the special tumbler (shown in the photo below), and during the month of January 2015, your brewed coffee will be free. Can I use this tumbler in the drive-thru, or do I have to go inside the cafe? There’s no reason you can’t use this tumbler at the drive-thru. However, you will want to tell the barista taking your order immediately that you have this promotion tumbler so that the barista doesn’t get your coffee ready in a paper cup. I do think it’s a little more ideal to go inside the store, but that’s just because I like going inside. However, it’s not a requirement. Can I get a syrup with the tumbler? What if my favorite coffee is blonde roast with vanilla syrup? Based upon what I’ve seen, if you’re using this tumbler and ordering brewed coffee, the inclusions for your coffee drink – such as vanilla syrup – will be complimentary. Can I get coffee with an add-shot of espresso with this tumbler? This should work. It’s still coffee that you’re ordering, and so long the shot of espresso is part of the coffee, this should be fine. I’d be very interested to hear whether this works this year – please let me know (when you can test this out, obviously). Can I get an espresso beverage or Frappuccino free in this tumbler? No. If you’re purchasing any handcrafted espresso beverage/ Frappuccino/ Refreshers/ Fizzio, you will only get a ten cent discount for using this tumbler. Can I get free iced coffee in the tumbler? I find this to be a bit confusing. I recall that one year I personally was hassled by a barista who told me “no” that iced coffee doesn’t count. But iced coffee is a brewed coffee. It’s a Starbucks iced coffee blend (brewed double-strength) and then includes a lot of ice to help chill it. I will say that most baristas I know would just say “yes” to this – it doesn’t make sense that it wouldn’t be included. I believe this should be included! Can I get iced tea free in the tumbler? I’ve heard people say that they called Customer Service and were told “yes.” There are four very, very high profit beverages which are refills to anything – iced tea, iced coffee, brewed coffee and hot tea. This is why they’re available as refills. As far as I know, the intent of this tumbler is that you could get free iced tea as your drink because it’s a refill option normally – yet I personally got very hassled on this one when I tried this. And on top of that, my own experience is that the registers won’t do that because it’s tea and not coffee. What I’m saying is that I feel like this very much should be a “yes” but don’t be surprised if you’re told “no”. Hopefully you’ll be able to get an iced tea in the tumbler. Can I get a Clover-brewed Reserve coffee as my free coffee? As far as I know, the Reserve coffees are not eligible as part of the free coffee perk for this tumbler. Though, I’d be curious to hear what your experience has been with that. But my guess is “no” you can’t get a Clover – Reserve coffee in the tumbler – though you’ll still get your ten cent cup discount. Can I get a pour over cup of coffee as my free coffee? That’s a good question too! I had always thought that the intent was that you could only get the ready, daily-brewed coffee in your tumbler, and not a pour over of a different roast. However, I’ve heard baristas say that they’d make a pour over for customers. Hope this helps! Looks for the January coffee tumbler beginning on Black Friday! Under any circumstances, be sure to tell your barista that you have the tumbler, when you are ordering. I neglected to include the price of the tumbler in the original post. It’s $30.00. Every single year, there have been moments that the tumbler causes confusion. The tumbler’s tag says “refill” on, and the above questions don’t have any firm answers. I suspect that January 2015 will bring a little confusion, as this tumbler does every single year. Enter to Win Starbucks For Life! The Ultimate Gold Card: Free Drinks for 30 years! Count me in the disappointed crowd. I only drink espresso drinks and was so hoping that I’d see a repeat of the espresso tumbler. Oh, well! It was fun while it lasted! I understand what you mean! This tumbler limits you quite a bit. I wish you could at least get Clover brewed coffee in the tumbler, but I understand why you can’t. When you’re using a reward, you’ve spend on average $60 to get a Lucky Dozen (that is, 12 transactions and Starbucks has a ticket of $5 – Starbucks estimates that many spend a minimum of $60 for each Lucky Dozen Reward) – So you, have in effect covered at least covered their cost of the free Lucky Dozen item. With the Espresso Tumbler, the drinks are a little lower profit margin than the 4 refill items (iced tea, iced coffee, hot coffee, hot tea) – And you’re essentially not paying for the free espresso drink at intervals – basically, I think that the Espresso Tumbler turned out to be a LOT less profitable than what Starbucks estimated. I mean, this is one reason why baristas should never hand out free drinks to their friends – same thing, it’s just free and over time it really, really adds up, and it’s not like the person has covered the cost of it over time. That’s my theory why no espresso tumbler – though it’s just a guess. In January I would get my espresso drinks iced in my tumbler and had no problem so I don’t think there should be any problems getting iced coffee this upcoming year. I understand how they most likely lost a lot of money but I still wish they were doing an espresso tumbler this year! re: pourovers. i would make a pourover for someone if they requested it. in my store, we stop brewing decaf at 10, and blonde at noon, so pour overs & clovers are very popular in the afternoon and evening. I wonder how this ties in w/ the promotional stamp/sticker card that’s valid until the end of January. If we get a coffee w/ a holiday syrup/sauce, such as Chestnut Praline, will that count as a holiday drink & earn a stamp, even though though it’s going to be free with the January tumbler? what are some examples of the brew coffee that this tumbler can be filled with? Now that I’m a customer rather than a partner, I went ahead and purchased one of these tumblers for my personal use in January. To my recollection, the discount code worked on all modifiers as long as the original beverage is a brewed drip coffee (so add shots, add syrup, add sauce should all be free inside the tumbler). I was worried they were going to raise the price of the tumbler, as there have been two price increases on drip coffee prices in the last year, but $30 was still worth it to me. I’ll be getting my grande Dark Roast, with 0-2 add shots per coffee, depending on the time of day / type of dark roast that is available. Does anyone know if you earn a star each time you get your daily, grande coffee? Hi HH! – You don’t earn a star for just getting the free daily coffee. The free coffee is not tied to your registered Starbucks card at all – lots of people will be using the tumblers who don’t use Starbucks card. Usually what happens is that the baristas know a special promotional code that discounts the coffee. There’s no exact science to tracking one coffee per day – I’m sure that in places like where I live – like 30 Starbucks super close to me – that there is really no way to full keep track to how many coffees were in the tumbler. I recently received the tumbler as a birthday present and my drink of choice is a grande Awake tea. I know you clarified that iced tea *should* work but I hoping it also applies to hot tea as its one of the four drinks. I guess I will find out in January. Just trying to find out if the numbers on the side of the re-fillable tumblers have any significance of anything at all. My friends and I have been trying to find out if the numbers stand for anything in particular and, naturally, a lot of things come to mind. (31-days in a month, 24-hours in a day, etc.) Please shed some light on this “dilemma” of ours. If it is a random set of numbers then, so be it. Just seems like there’s some thought behind the choice of numbers, that’s all. Thanks. (And don’t send me to the “ideas” website. It has been no help at all. Does anyone know if the cup can be used outside the U. S. for free coffee? I bought the cup for my husband for his birthday (Jan 1) and forgot he is going to be gone to England from Jan 2nd-Jan 17th..So wondering if he will be able to use it over there. I picked one up for myself over Thanksgiving weekend. What surprises me is that the mugs are not available in stores at this time (Dec. 31). At this time last year you could buy overstock in many stores, but not this year. Maybe they lowered the price and the Christmas shopping crowd picked them up? This morning I used my free brewed coffee mug. I tried to get an iced coffee, but the register does not apply the discount code to an iced coffee… Looks like the only way you can get an iced coffee is if a barista is kind enough to ring your drink up as a hot one and give you an iced coffee instead. Stupid. Brewed coffee is brewed coffee. I think Starbucks made way less of these cups than last year because there are none leftover in stores and they are not available online anymore. Last year stores still had them until the middle of January and had them 60% or more off. Went through the drive through. Told ’em I had the Jan. refill tumbler and I wanted a Grande Iced Coffee, black, no ice. Pulled up to the window, handed off my tumbler, got it back with my ordered drink, and away I went after I handed off my tip. How do espresso shots taste in an Iced Coffee? Was told when I purchases 6 SIX tumblers that it was for any starbucks drink like years past. I even asked can I still ask for no froth in the refill cups because I know that takes more coffee and time. Now my friends and family go to use the cups and are told only coffee. I went today and had to fight for an ice coffee. I’m very upset. Very disappointed. I will be gathering cups today and digging through my receipts from Christmas. They better take them all back. 30 each at 6 and I’m sure I paid tax. Damn it. Not good. And I was telling everyone it’s the best gift ever. I’m not going back to starbucks after I return these and I’m sure they won’t let me return them even though they told my husband find the receipt. My husband tried to return his today and get 30 on gift card. They told him to bring in receipt. He is more upset then me and visits starbucks throughout United states. Not anymore ! Day 1: Went to a non-stand alone store and asked for my free coffee. Got it but was told that that Pavilions/Vons (a market) was not a “participating retailer”. Day 2: Went to find a stand alone store. Never noticed how BAD the parking situations are around stand alone stores in the area compared to the non-stand alone stores. Has anyone tried getting the free coffee more than once a day at different stores? Does it work? Or do they track with the 3 digit code on the side if the tumbler. re: more than one coffee per day. It’ll work, however you’re on the honor system. Agree. Sure you can steal, but you’re not supposed to. Had pushback at my regular store about it not being for iced coffee, but they’ll do it this time. When cashier put in iced coffee the code did not work. Pretty sure I saw Starbucks tweet that iced coffee is ok. Anybody have a document I can show them? and as an aside, this is where I really get frustrated that a company this large can’t get basic info out to its stores and/or at least program the registers correctly. Here is the Starbucks tweet. @HH – Thank you! That’s the most clear thing Starbucks has said about the tumbler! They really make this confusing every, single year. And still, if you can get a coffee with an add shot, or modifiers, it just makes no sense that you can’t get an iced tea. An iced coffee or coffee with an add shot is way more expensive than one iced passion tango tea! Last time I tried register still wasn’t applying discount on iced coffee. About half the baristas have rang it up as hot and gave me iced. Lame. that is strange, wonder why they would delete it. Yesterday, the code seemed to work on iced coffee at the same store that told me “just this time” because the register said no. So maybe try again. I would also show them the tweet. I had it ready on my phone. Not sure how else to prove. Also, on that same tweet, Starbucks replied to my complaint about the register code and tweeted me to contact them about it. I haven’t because I haven’t had the problem anymore and also every call to Starbucks customer service ends up being a 20+ minute ordeal. I purchased the refillable coffee cup last year for $32 and purchased again this year for $40. Its a great gift for people that frequent starbucks. does it work for white chocolate mocha? ^ That’s a lot more current article, rather than this old one.